Leaving the south west and heading north. 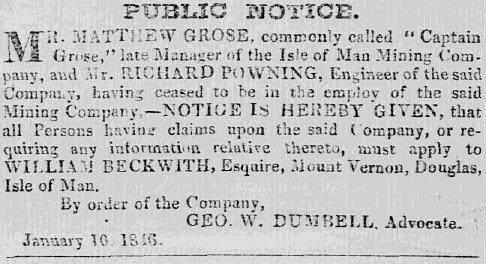 Matthew Grose, born in 1788, is the Adventurous Ancestor who left the mines of Cornwall and Somerset in England. Around 1828 he was seeking new opportunities in the mines of Foxdale in the Isle of Man. 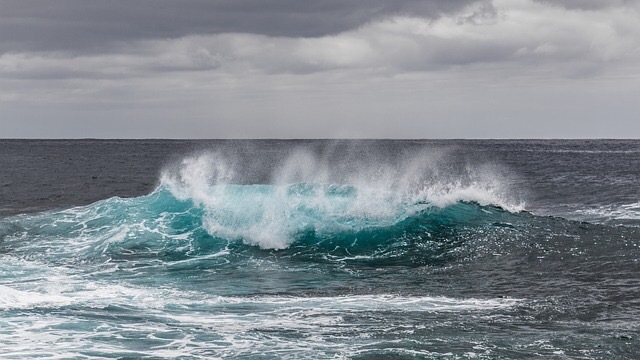 Moving with his wife, children, other family members, friends and mining / engineering colleagues from Cornwall – they all headed across the breezy Irish Sea. Upon arrival in the Isle of Man, his community-minded wife, Mrs Mary Grose (nee Wearn), would have noticed the hustle and bustle in the town of Douglas. Matthew Grose came from a renowned family of mining captains and engineers. Like other Cornishmen migrating to the Isle of Man, he brought with him specialised skills and direct experience of new technologies that were revolutionising mining at that time. 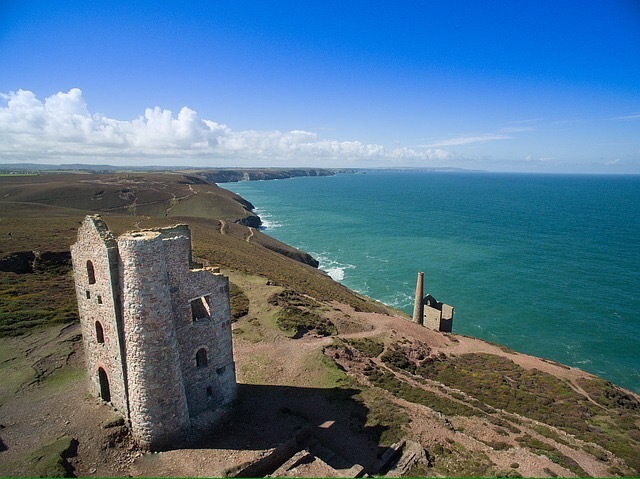 Previously we’ve read about his father, Matthew Grose (1760 – 1824) and uncle, Samuel Grose senior (1764 – 1825) who were mining captains in Cornwall and Somerset. Captain Matthew Grose (1788 – 1849) was a first cousin to Captain Samuel Grose junior (1791 – 1866), who was a pupil of Richard Trevithick. Samuel Grose junior was called the ‘most scientific engineer in Cornwall’. Many of Matthew Grose’s sons became mine captains, agents and engineers. His sisters and daughters married into families of other Cornish mine captains and engineers. 1788 Matthew Grose is baptised at the parish church of St Andrew, Loxton, Somerset. His father, Matthew Grose and uncle, Samuel Grose are likely in Loxton with other Cornish miners on an expedition to explore the green veins that have been found in the caves there. Unfortunately these contain no copper and the venture is abandoned. 1789 (likely earlier) – 1800 His father, Matthew and uncle, Samuel are mine captains at the Dodington copper mines. 1793? His brother John baptised in ? 1797? His sister, Elizabeth baptised in Somerset? (Wife of Obadiah Ash?). 1801 Dodington copper mine in Somerset closes when unable to raise capital to buy a steam pumping engine. 1801 His brother William and sister Grace are baptised in Gwinear. 1809 His sister, Mary, marries Henry Francis in Gwinear. 1809 Aged 21, he marries Mary Vivian Wearn in Phillack. 1810 His uncle, Samuel Grose snr and cousin, Samuel Grose jnr, puts their names to a ‘protest of miners’ at Wheal Alfred in the Royal Cornwall Gazette. They are distancing themselves from political reformist, Edward Budd who was establishing a new newspaper (the West Briton or Miners Journal). A ‘Matthew Grose’ signs the petition too – likely him (or father). 1812 His daughter, Emma is baptised in Phillack. 1814 His daughter Jane is baptised in Phillack. On one census she describes herself as from Relubbus. Perhaps her father worked at mines near there. 1817 Dodington Copper mines in Somerset reopen when a steam pumping engine is installed. 1819 His son, Matthew is baptised in Phillack. 1821 Dodington mines in Somerset close after heavy losses. 1826 His son John is born in England. (No baptism record found yet). John is husband of Charlotte Clucas. 1826 His daughter Mary is baptised in Phillack. 1828 Isle of Man mining company formed by investors from Liverpool, Chester and Flintshire and lease Foxdale mines. 1835 His eldest daughter, Emma, marries Captain Jonathan Harrison (both ‘of Foxdale Mines’) at Kirk Patrick, Isle of Man. The couple move to Llanidloes in Wales, then onto Meadowtown, Westcott and Snailbeach mines in Shropshire. 1837 His sister, Eliza, marries Captain Absalom Francis in Shrewsbury, Shropshire and then to the mines of Halkyn, Flintshire. 1840 His daughter, Jane, marries Richard Powning in Marown, Isle of Man. The witness to their marriage is Foxdale Mine Captain Edward Bawden. 1841 He appears on the 1841 census at Foxdale Mines, Isle of Man as a Mine Agent along with his children Matthew (miner), Thomas (engineer), John (engineer), Mary, Eliza, Edward, Lavinia and Samuel. 1841 His son, Captain Matthew Grose, marries Anne Weston Read in Kirk German, Isle of Man. Opens stone quarry to send granite to Birkenhead for building docks. Please contact if you spot any errors, or have additional information to improve this post!